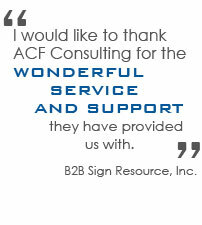 You can trust the desktop support specialists at ACF Consulting with all your needs. Our Microsoft certified experts can manage all your IT systems as well as troubleshoot and usually correct many problems remotely, through email, on in person. We provide 24/7 monitoring to make sure your systems are secured and working properly. Our desktop support technicians will provide everything you need to keep your business IT functions running smoothly. Our friendly staff of certified desktop support technicians keep up to date on the latest technology to ensure your systems up and running. We know when things aren�t working properly it can mean lost business, so at ACF we always try to provide support in a timely manner. You�ll never have to go through a series of pre-determined questions or pre-written scripts. When you call our desktop support specialists, you always get to talk to a person instead of a machine. We�ll determine your problem and figure out the best way to fix it, usually right over of the phone or though our remote support service. Our knowledge of computer systems is what helps keep our clients up and running. When you sign up for managed IT services with ACF Consulting, you get professional service with a personalized touch that some of the bigger companies don�t provide. Our system provides better services for our clients, lower standard monthly costs, and results in less disruption to business flow.